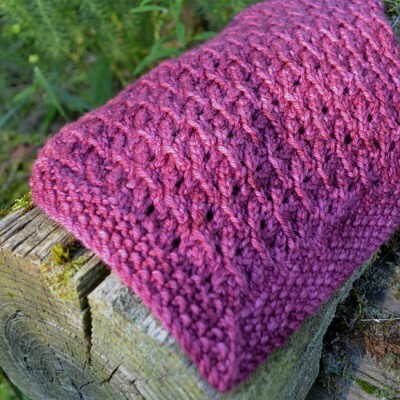 Hold onto the sweetness of summer through the colder months with the Loganberry Cowl. Knit in a sumptuous worsted weight yarn, the Loganberry Cowl features a delicate miniature leaf pattern bordered in a delightfully bumpy seed stitch reminiscent of the berries for which it is named. Kerchief shaping yields added warmth at the neckline. One size. 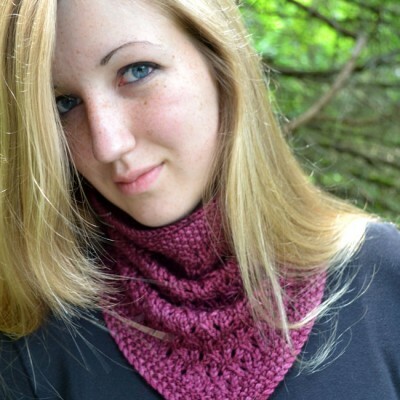 Cowl fits over an average adult head size of approx 20” – 23″ (51 cm – 58 cm). Blocked cowl circumference is approx 18” (46 cm). Length is approx 13” (33 cm). The pattern is fully charted, but also includes complete written directions so the ability to read a chart is not necessary to work this pattern. Directions for how to work shadow wrap short rows and Russian bind-off are also included for those who may be new to these techniques. Using smaller-sized needles, 18 stitches/24 rows to 4” x 4” (10 cm x 10 cm) in stockinette stitch, unblocked. 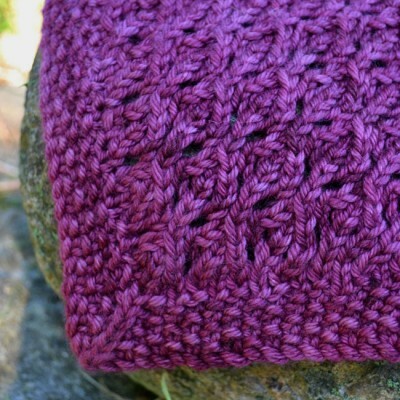 The Loganberry Cowl is worked from the bottom up using a combination of knitting in the round and short rows. NOTE: Pattern utilizes the shadow wrap method of working short rows. The standard wrap and turn method of working short rows is not well suited to this pattern. If you haven’t worked shadow wraps before, Alice Yu’s ’Socktopus Unplugged’ blog has a wonderful photo tutorial on how to work this awesome short row method. 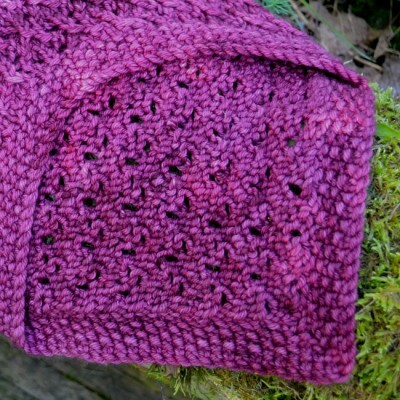 The Loganberry Cowl pattern includes written instructions on how to work the shadow wraps as well. 130 – 140 yards (119 – 128 m) worsted weight yarn. As this cowl is designed to be worn close to the neck, a soft, worsted weight yarn with a nice drape, while maintaining good stitch definition and little to no halo is recommended. Cashmere, merino or silk blends would be a perfect choice. Slight tonals work well, but highly variegated yarn will distract from the lace and the textural border.